FOX introduced a few new law enforcement TV shows, in the 2016-17 television season. While Lethal Weapon has already been renewed for a second season, APB is struggling in the TV ratings and could be cancelled. Which path will the new Shots Fired TV show follow? Will it be cancelled or renewed for season two? Stay tuned. 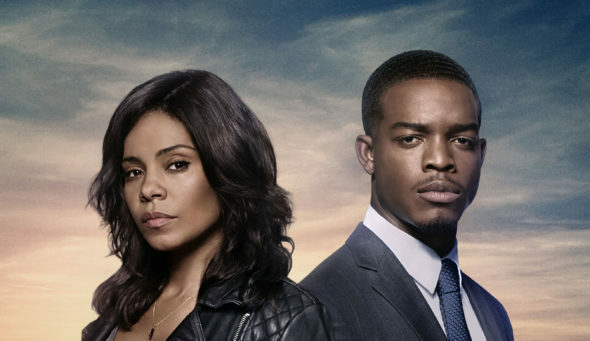 Airing on the FOX television network, Shots Fired stars Sanaa Lathan, Stephan James, Stephen Moyer, Will Patton, Mack Wilds, Aisha Hinds, Clare-Hope Ashitey, Conor Leslie, DeWanda Wise, and Richard Dreyfuss. Helen Hunt, Jill Hennessy, and Dennis Haysbert guest star. A timely mystery drama thriller, Shots Fired is a 10-hour limited series which explores the tense aftermath of two racially charged shootings in a small North Carolina town. When African-American Deputy Joshua Beck (Wilds) shoots and kills an unarmed white college student, it unsettles his small burg. As word spreads about the overlooked murder of an African-American teenager, tensions flare. Launching an investigation, the Department of Justice dispatches experienced investigator Ashe Akino (Lathan) and young Special Prosecutor Preston Terry (James) to investigate. What do you think? Do you like the Shots Fired TV show? Should it be cancelled or renewed for a second season on FOX? 5/15/2017 update: There won’t be a second season of Shots Fired. Details here. Shots Fired: Season Two; Would You Keep Watching the FOX TV Show? Shots Fired: Could There Be a Second Season of the FOX TV Series? I really enjoy the show. I was looking forward to 2nd season. I’m hoping some network will pick up shot fired. Shots Fired was one of my favorite shows. Please find a way to bring it back.